Getting ready for Winter…real fast, on a New England Classic! Here in New England and specifically in Vermont, we’re in one of those weird transition periods where you can be in the sun in crisp Fall temps pulling down on dry stone, or swinging and kicking and scratching your way up barely-there ice and mixed lines from early season cold snaps, or… you can be inside your house looking out at the 40 degree temps watching the pouring rain wash away any hopes you had of climbing that day. This description sums up the past week or so we’ve had here at the Smuggs Ice Bash headquarters, with only some slight variations! 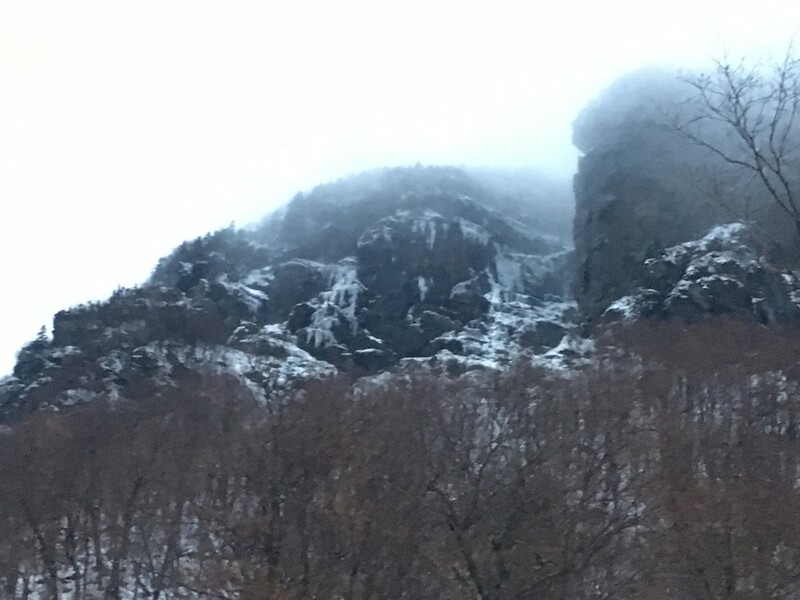 Nine days ago we were out all day rock climbing in the sun on warm dry stone, 5 days ago we were out climbing on one of New England’s famous ice routes, The Black Dike (WI4, M3) on Cannon Cliff, and 2 days ago we were running around Smugglers Notch in giddy anticipation for the waterfalls to freeze and just enough ice to form and bond with early season shenanigans of something cool to ensue! The Black Dike is the left-most ice flow right of the prominent arete (Whitney-Gilman Ridge, 5.7) with the two lines Hassigs and Fafnir, moving right. From the parking lot we headed up across the talus field in anticipation of being the only party on the route. It had one ascent the day prior and we were excited for what seems to have become our annual October send of the route. 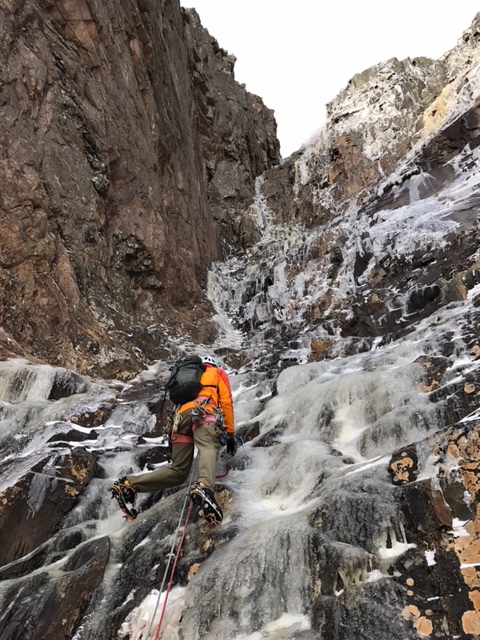 Tying in to the ends of the ropes and grabbing the rock and ice rack, we delicately climbed through the long first pitch of thin ice and mixed terrain. Protection was mainly as good as your climbing ability. 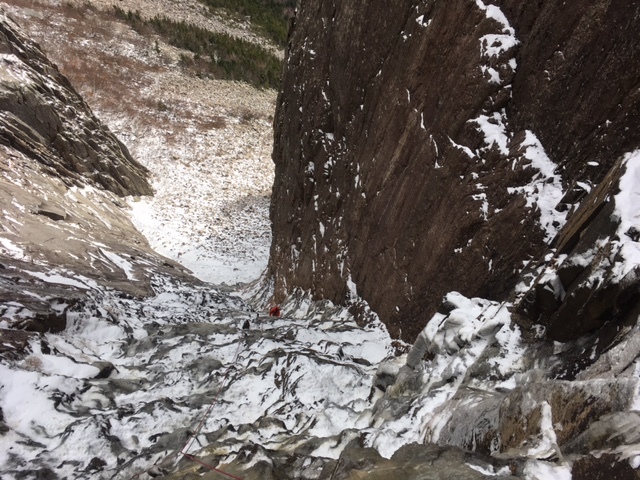 A few 10cm screws throughout the entirety of the first pitch (200ft) kept the ropes running in the general direction they needed to be, but a fall on this terrain would not have been pleasant. 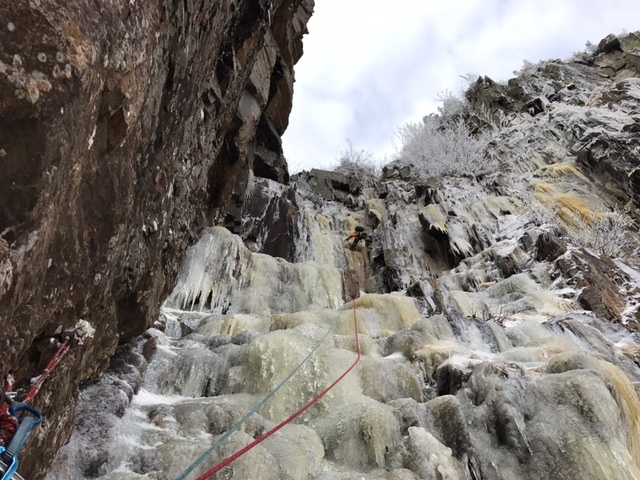 Constant small bulges kept the climbing interesting with thin and sticky ice with the occasional rock move or two until the fixed anchor marking the start of Pitch 2. While the climbing was never that difficult at any given point, slow and thoughtful upward movement was key to the success of the day. Thoughtful and purposeful swings and deliberate footwork while snaking the correct path up the wide first pitch was standard fare that carried throughout the upper pitches of the climb. The prominent wall on the right and looking down onto the talus field and the tree’s below is always and impressive sight. Leaving the belay at the start of Pitch 2 and the famous rock traverse means you’re in the meat of the climb. The angle of the climb steepens and initiating correct movement is crucial, as a slight slip would not end well for the leader. Cross the traverse and it’s on as you’re never really sure what you’ll get. We were met with marginal to poor protection with a good, confidence inspiring piece of pro only every so often on the pitch. 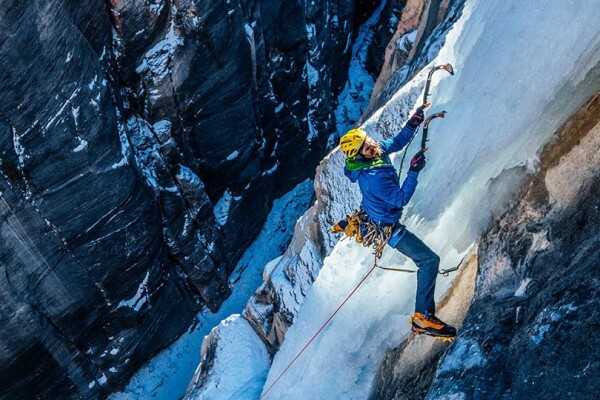 Icy and verglassed cracks made the climbing and protection insecure at points, but never desperate beyond control. 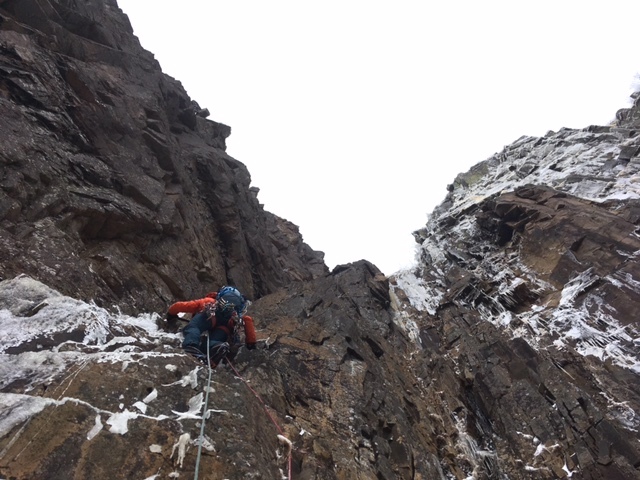 The most exciting portion of Pitch 2 was the iced chimney up high where a layback technique with ice tools in a horizontal plane was the key to upward progress — it was a cool new move that neither of us had had the pleasure of using before. Pitch 3 always has more ice on it. Leaving the belay, we chose to follow the path of least resistance. A few short steep ice steps with thin ice for front point placement made for some exciting moments as we weren’t sure whether our front points would shear thru the thin ice or not. Mediocre gear placements and a couple good screws and cams kept the bar on the risk factor from ever getting too high. 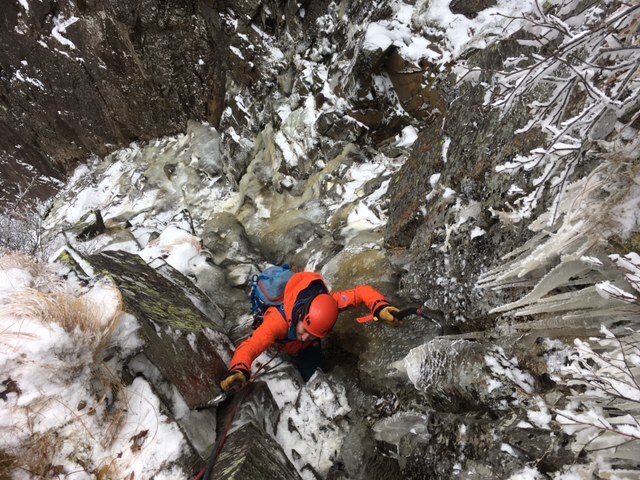 A few more swings were required on the last pitch as some of the ice seemed to be of a denser quality and a bit drier then the stickier ice we found on the pitches below. Choosing to exit up and right into the trees on the last steep sections is always rewarding as you are met with great turf shots on the top. Except this time around the turf at the top wasn’t frozen yet, making for a bit more of a delicate approach to top out into the trees! We took a quick break there to have a celebratory snack and to coil the ropes and we were on our way down, hiking back to the car on the walk off trail. 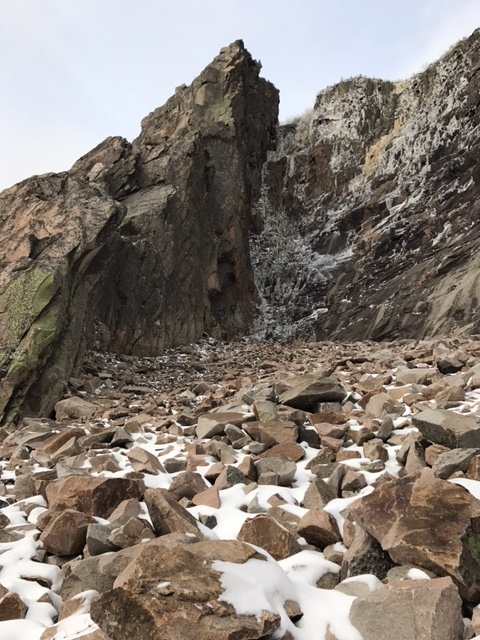 Only a couple hours car-to-car made for a great morning out on Cannon Cliff and excellent kick-off to what we hope will be a long, cold, and prosperous winter climbing season! 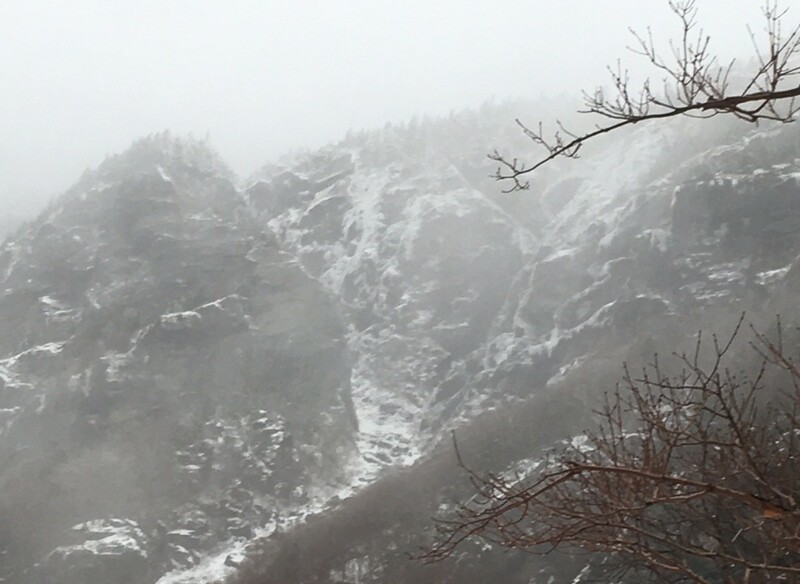 Plenty of precipitation throughout the day means there’s lots of moisture in the system and as soon as we receive that deep freeze one night, the climbs are going to start to fill in quickly. Be ready! 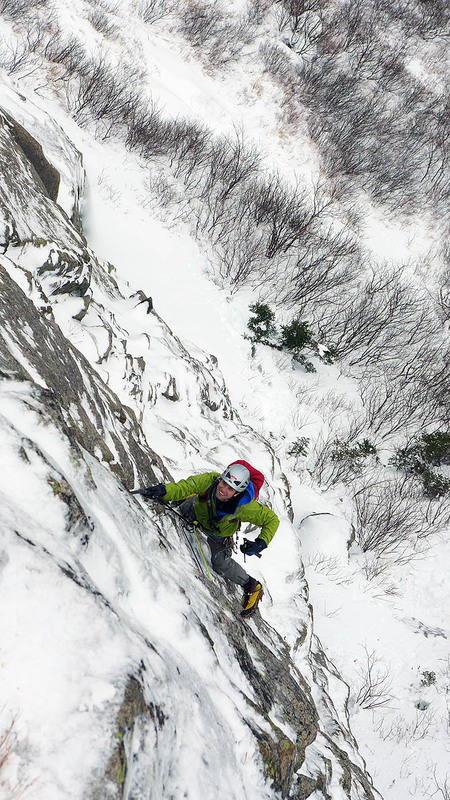 With all this flurry of activity surrounding early season winter climbing, we are more excited than ever to bring a great Smuggs Ice Bash to you this year. So mark those calendars for January 20th-22nd, 2017 and stay up to date on all the latest developments on our website, Facebook page and on our Instagram account! Previous post RAB: For the most extreme conditions in the world! Next post Updates Ongoing! New Hampshire’s Finest coming to Vermont!